I love making gougères as appetizers for my dinner parties. They’re pretty easy to prepare and are always a hit. When my friends ask, “What are these?” and I usually just respond, “Cheese puffs!” Gougères seems to be such a formal name for something so fun and easy to eat. My recipe is based on an old flyer that was meant to entice you to subscribe to Saveur Magazine. I still have the original copy—grease stained and torn—in a plastic sleeve, the kind you use to put in a three ring binder. Oddly, it features a portrait of a french writer holding a cat from the 1920s and two sentences about her as an introduction to these baked treats. The flyer never did succeed in selling me a subscription, but, I think the cute cat must’ve sold me on trying the recipe. I’ve experimented a lot with this base recipe over the years. Below is my favorite variation. What I’ve learned from trial and error is NEVER open the oven while your gougères are baking. They will not bake up as big as they should. I like to bake mine one cookie sheet at time, since I can’t open the oven to rotate them and my oven won’t fit 2 sheets side-by-side. Better to slightly overbake than underbake, which will cause your puffs to deflate soon after they leave the oven and be a little gooey in the middle. Though even when these mistakes were made, no one seemed to notice and they were gobbled up anyway. 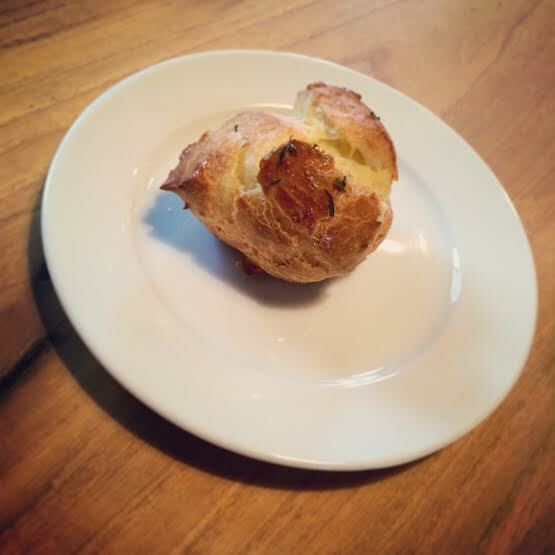 I like mine plain with thyme and gruyère, but have piped savory fillings into them as you would a cream puff or cut them in half to make little sandwiches. I’ve never been able to eat just one, and I bet you won’t be able to either. Preheat oven to 400 degrees. Line 2 cookie sheets with parchment paper or silpat. In a medium sauce pan over medium-high, combine water, milk, butter, salt, pepper and nutmeg and bring to a boil. Reduce heat to low and stir to melt butter. As soon as butter is melted, add flour and stir vigorously with a wooden spoon for about 1 minute to combine mixture and cook until dough pulls away from the side of the the pan. Remove from heat and stir in cheese and thyme. Keep mixing for 2 minutes or so to cool dough slightly before adding eggs. You can also move the dough to a stand mixer with a paddle for ease at this point. Incorporate eggs, one at a time into batter, making sure that each egg is incorporated completely before adding another. Spoon about a 1 1/2″ rounds of the dough onto your cookie sheet, setting them 2″ apart. In a small bowl beat egg and water together for egg wash.
Brush the top of each gougère generously with egg wash. This will add shine and color to your puffs. Optionally, you can sprinkle a little grated cheese or a few thyme leaves on top before baking. Bake for 18-22 minutes or until gougères are golden brown. This entry was posted in Cooking and tagged appetizer, baking, butter, cheese, cheese puff, easy to make, flour, Food, french, gougère, gougères, homemade, recipe, thyme, thyme and gruyère gougères on April 29, 2014 by friedchickenanonymous.